Ten passengers on a plane from Beijing to London which crash-landed at Heathrow Airport are to sue aircraft manufacturer Boeing. 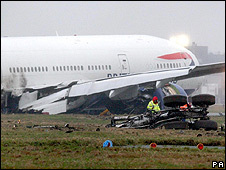 The British Airways flight, with 152 people on board, crashed in January 2008. Everyone on board survived. But a number of passengers were injured and London-based firm Stewarts Law has started an action against Boeing on behalf of 10 passengers. Boeing said in a statement: "We will not be making any comment." One of the passengers is Paul Stafford, the academic director of international development at Kingston University in south-west London. He said: "I remember smashing into the ground and the undercarriage being forced through the wing by the impact. I was convinced that I was going to die. "I think about the crash every day and wish it had never happened to me." The UK's Air Accidents Investigation Branch (AAIB) is still working on a final report into the incident. It has so far produced two interim reports which have said there was a reduced fuel flow to both engines as the plane came in to land. The AAIB's reports have looked at the possibility that ice accumulated in the plane's fuel system. Claiming that the 777 was defective, Stewarts Law has lodged a lawsuit with the Circuit Court of Cook County in Illinois, in the United States.